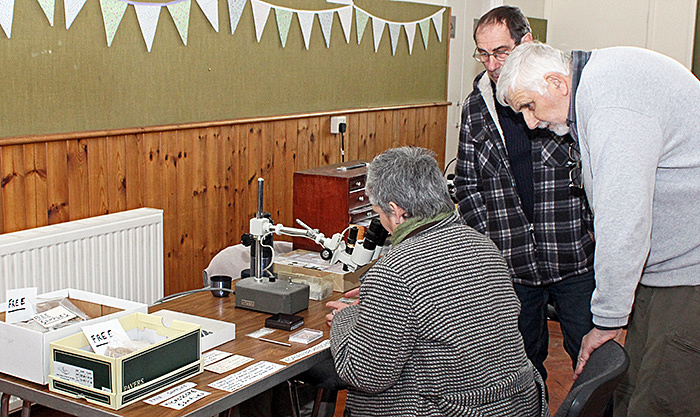 The spring meeting in the Village Hall at Langton Matravers in Dorset was organised by Derek Stevens and Brian Darnton and attended by a good crowd of microscopists from the Quekett and the Postal Microscopical Society. 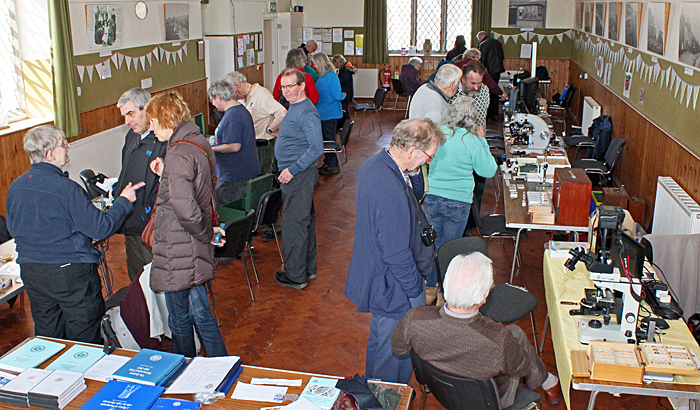 Thanks to some local publicity, the meeting also attracted several visitors, including families. 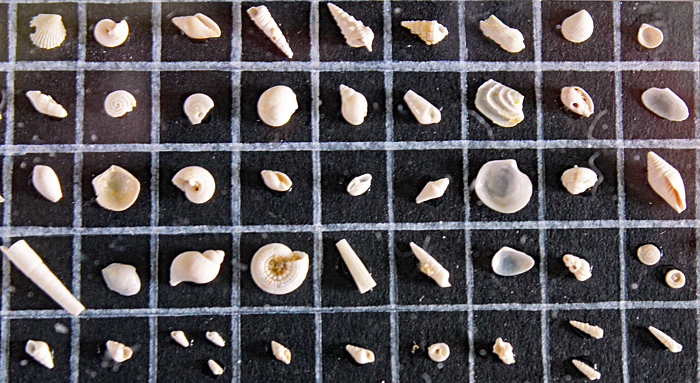 Adrian Brokenshire brought along a polished wooden cabinet of nicely-prepared forams and shells from sand, and we were able to admire them under his Meiji BM long-arm stereomicroscope. 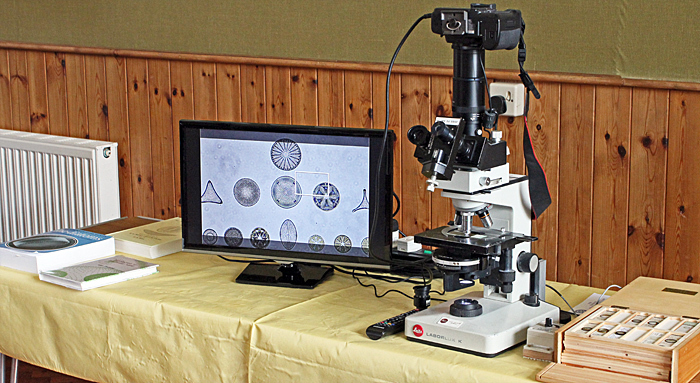 Brian Darnton used a black and chrome Beck monocular microscope and a black and brass Spencer monocular microscope to show slides that has made of forams from Dogs Bay in Ireland. 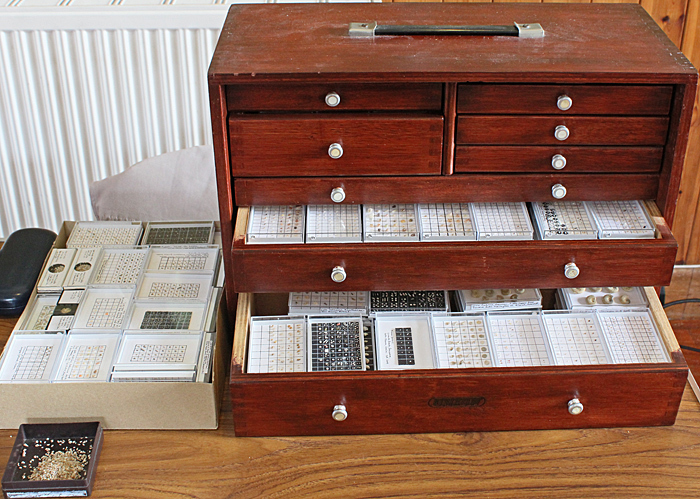 This year, Brian has been inspired by Victorian slides made for the polariscope containing arrangements of plant scales and cactus spines. 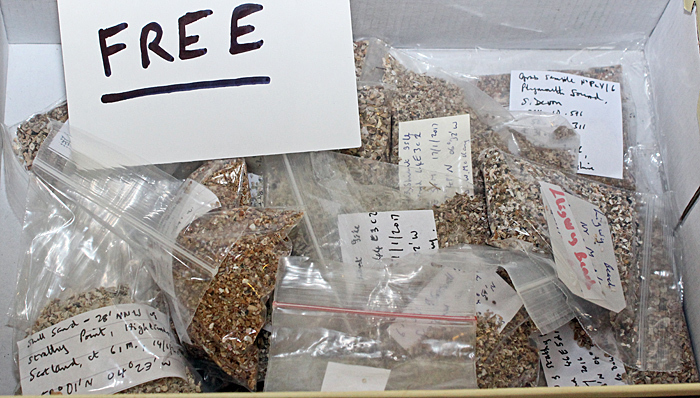 Suitable plants are those in the family Elaeagnaceae, notable the European genera Elaeagnus and Hippophae and the North American genus Shepherdia. 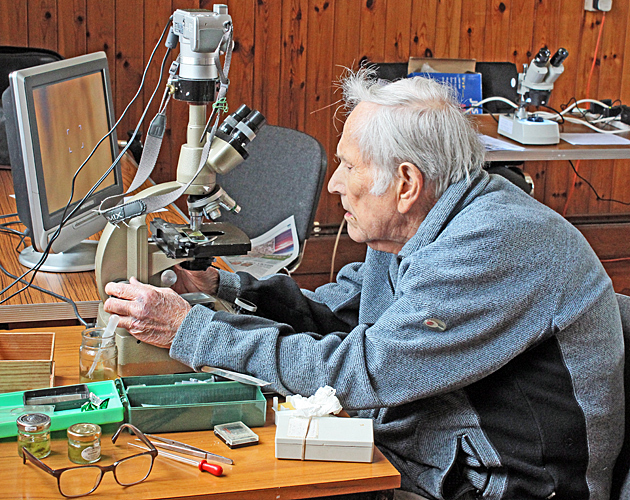 He has made slides of the scales as well as arrangements, and they looked good between crossed polarisers under his own microscopes and even better under Jeremy Poole’s Zeiss Photomicroscope. 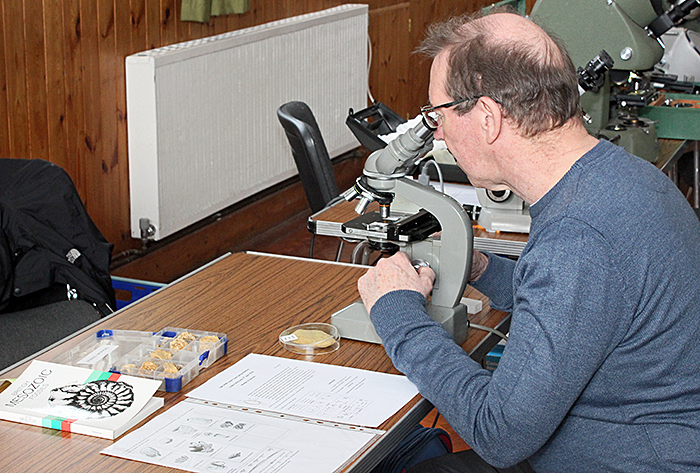 Brian also had some photographs of testate amoebae under crossed polarisers, and early illustrations of forams by Robert Hooke, Ulisse Aldrovandi and Antonie van Leeuwenhoek. 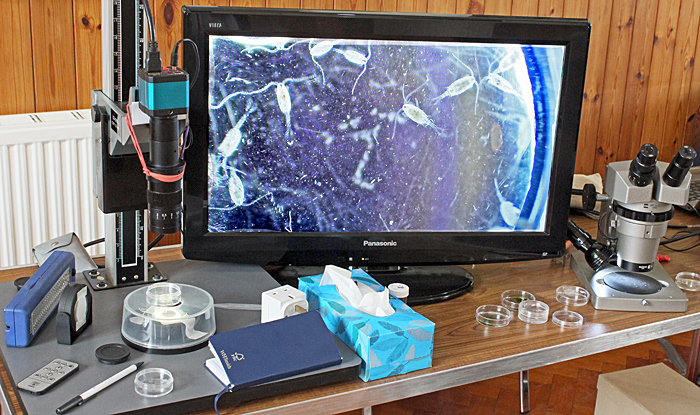 Derek Stevens used his trinocular Vickers compound microscope and Panasonic Lumix DMC-FZ7 camera (mounted afocally) to show aquatic life from his birdbath on a monitor. Specimens included rotifers and Haematococcus pluvialis, taxonomically a green alga but visually red because it contains astaxanthin. 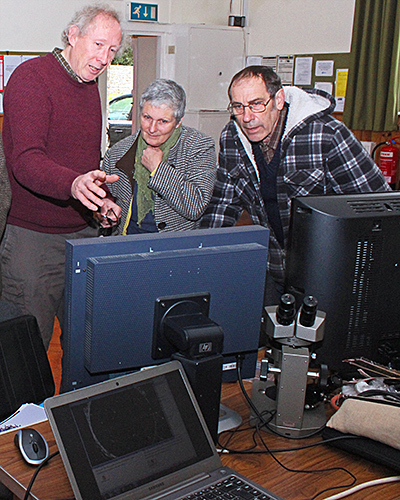 Grenham was also showing a video of spionid annelid larvae on a very nice LaCie 321 monitor. 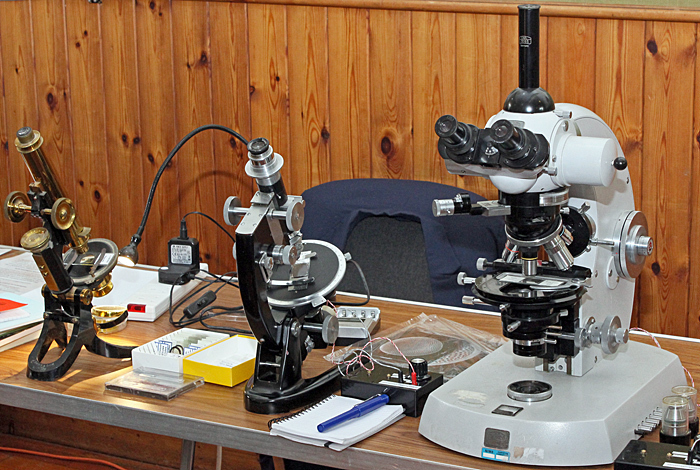 Jeremy Poole has started taking an interest in polarised light microscopy and brought along 3 microscopes, a black and brass Swift petrological microscope from 1912 (with Nicol prisms), a black and chrome Swift petrological microscope from the 1960s, and a Carl Zeiss Photomicroscope II fitted with a calibrated rotatable analyser. His slides included a Biosil slide of hippuric acid crystals, a Spike Walker slide of dopamine hydrobromide crystals, and thin sections of rocks. Jeremy also brought some books, A colour atlas of rocks and minerals in thin section by W. S. MacKenzie & A. E. Adams, The preparation and mounting of thin sections and small whole mounts of rocks and minerals for microscopical examination by Derek D. Underhill, An introduction to crystal optics by P. Gay and Minerals and the microscope by H. G. Smith (revised by M. K. Wells). Joan Bingley brought 2 exhibits. 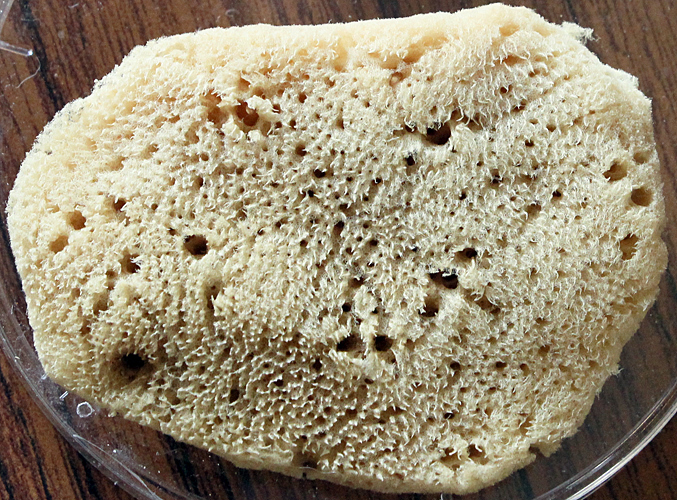 One was a portion of a human tooth, viewed under a simple stereomicroscope bought on eBay. Joan’s other exhibit was a Chinese 14 MPixels inspection camera, used to view a set of NBS F. W. Algae slides lit by a light box on a 21″ Samsung television. In the photograph below, you can see filamentous algae from Derek Stevens’ birdbath and we could see ostracods and a fly larva. 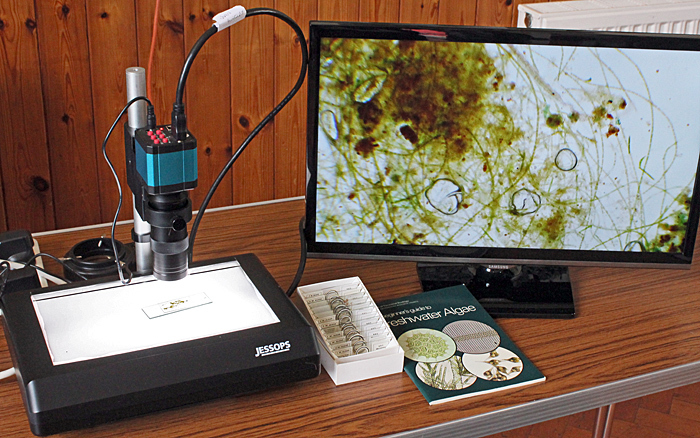 Joan also brought A beginners guide to freshwater algae by Hilary Belcher & Erica Swale. 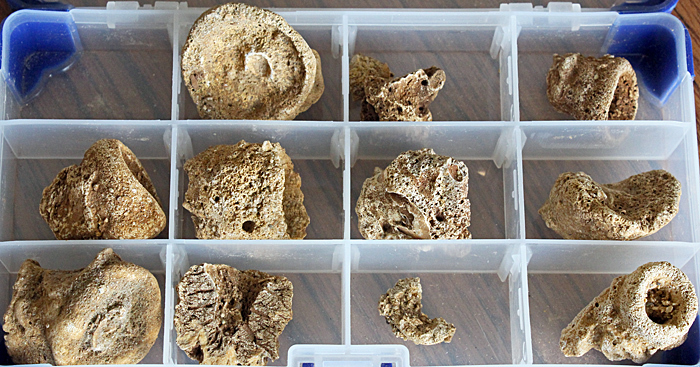 Kit Brownlee reprised her exhibit on sponges from the Reading Convention, showing a sponge from the Mediterranean, some fossil sponges, and a Klaus Kemp slide of 50 arranged spicules under her Olympus KHC microscope. Kit also brought a Natural History Museum book, British Mesozoic Fossils. 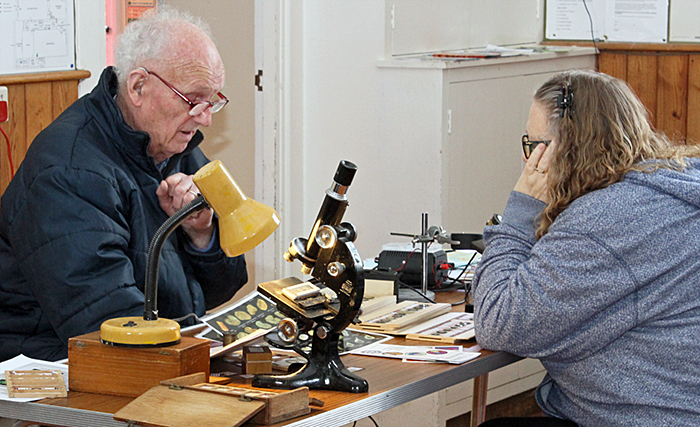 Mervyn Bown bought a box of diatom slides from the estate of Ven Dodge at the Reading Convention a few years ago, and we could examine them using his trinocular Leitz Laborlux K, fitted with a magnification changer and a complex measuring eyepiece made by Malies Instruments. Mervyn used his Canon EOS 5D Mark II to display the slides on a Samsung television. 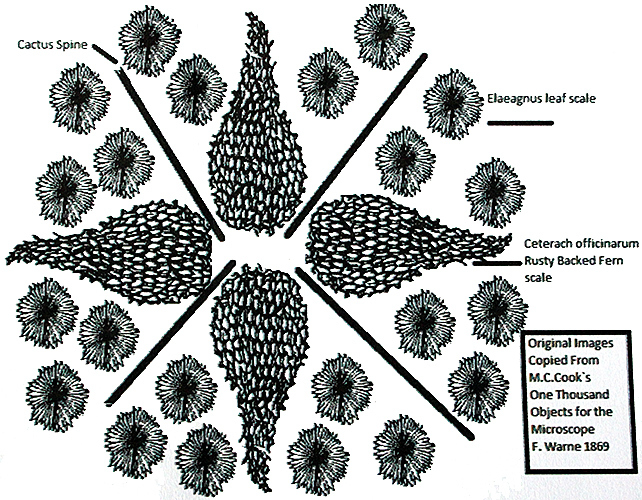 The slides included ones made by Ven, Brian Darnton and Bernard Hartley and an arrangement by Frith. 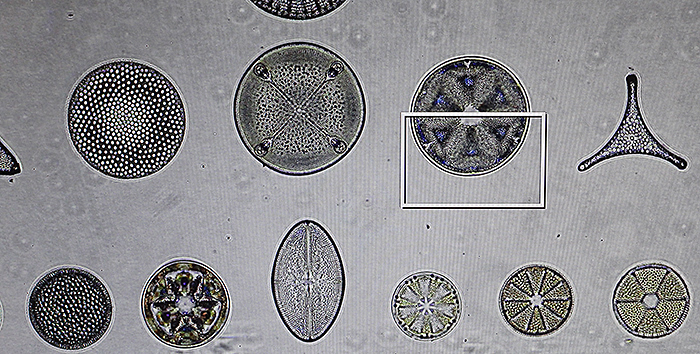 According to the label, the Frith slide was a reject, but the diatoms seemed to be lined up perfectly and the the only fault we could find was a few specks of dirt. Mervyn also brought 3 books, Introduction to freshwater algae by Allan Pentecost, An atlas of British diatoms by B. Hartley, and The diatoms: Biology & morphology of the genera by F. E. Round, R. M. Crawford & D. G. Mann. 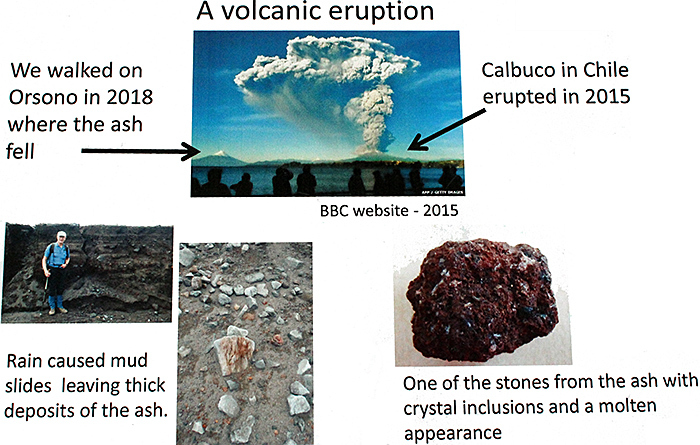 Pam Hamer brought a poster about a volcanic eruption in Chile and some of her slides of rocks polished on one side to reveal microfossils. 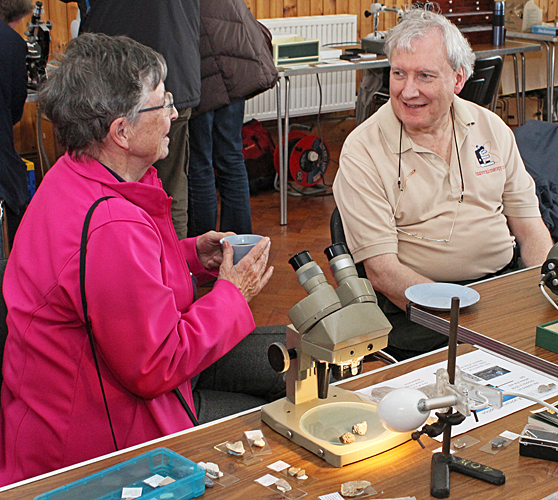 Pam also brought two books, Rocks and minerals: A guide to minerals, gems and rocks by Herbert S. Zim, Paul R. Shaffer & Raymond Perlman and The field description of igneous rocks by Dougal Jerram & Nick Petford. 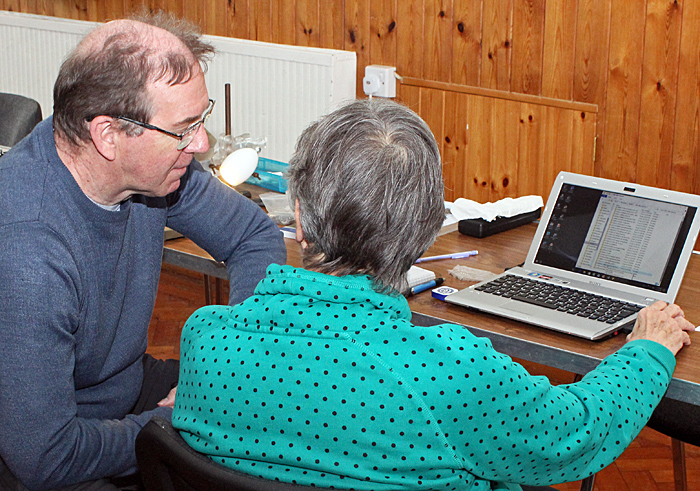 Pam also brought a laptop with the latest test version of the database of the Quekett slide collection, and persuaded more people to help with transcribing data from slide labels into Excel spreadsheets. 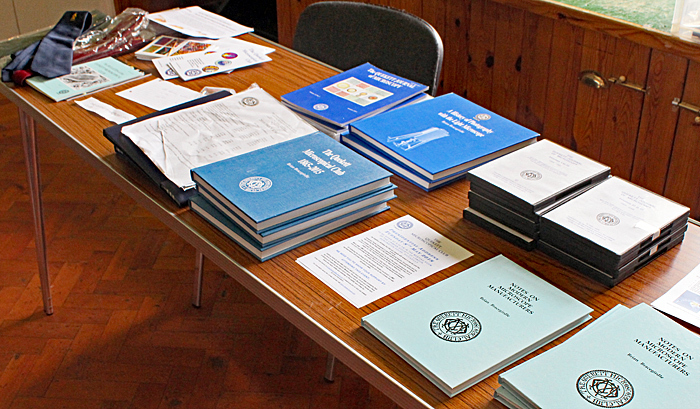 Robert Ratford brought the Quekett Shop so that members could buy books, ties, binders and the USB drive containing the Journal from 1868 to 2012. 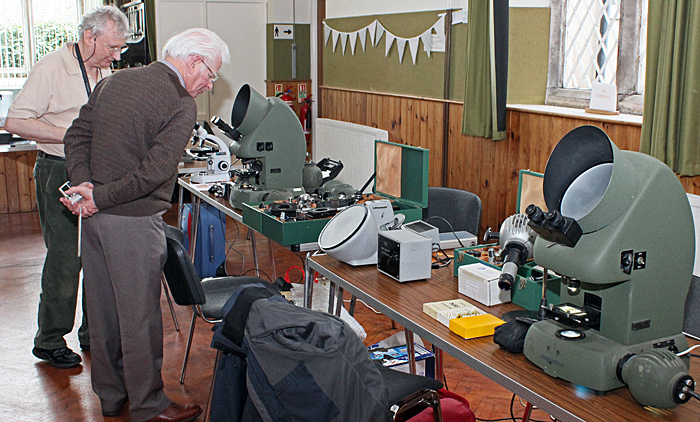 Robert Ratford and Graham Matthews are fans of the Swiss Projectina microscopes so there were 2 on display as well as boxes full of accessories. 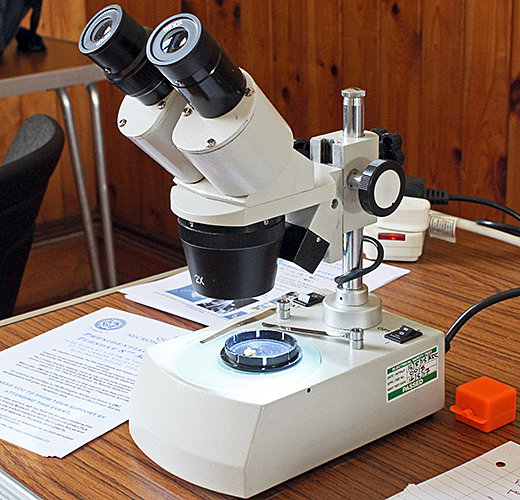 These microscopes can be used via the binocular eyepieces or they can project onto a built-in circular screen or (after removing a panel at the rear) an external screen. They could be used for transmitted light or reflected light, and even epi-fluorescence and were very useful for measuring. 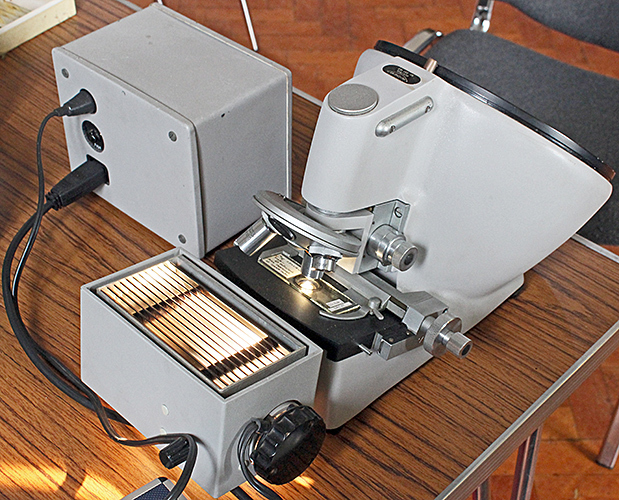 Graham had used one to measure droplet sizes, and Pam Hamer had used one when she was a foresnsic scientist. 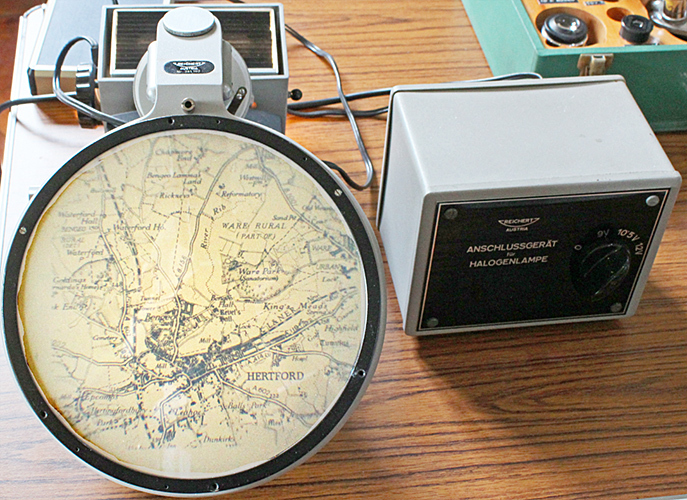 Robert also showed his Reichert Visopan projection microscope, demonstrating it with a microphotograph of a map from the Quekett’s collection. 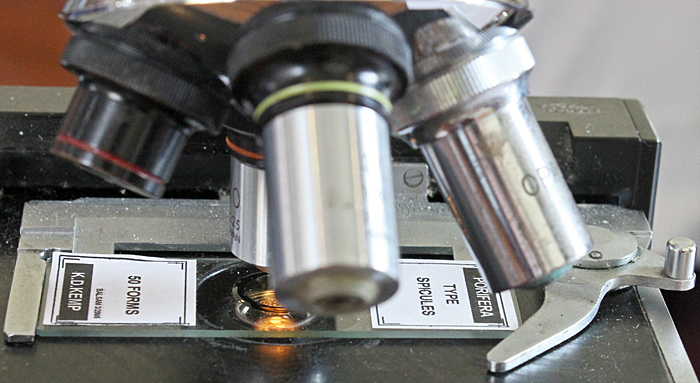 Steve Durr used his Zeiss Standard microscope to show pathology slides including fatty liver disease, gonorrhoea (caused by the bacterium Neisseria gonorrhoeae) and anthracosis in the lung of a smoker. Steve provided notes on these diseases. 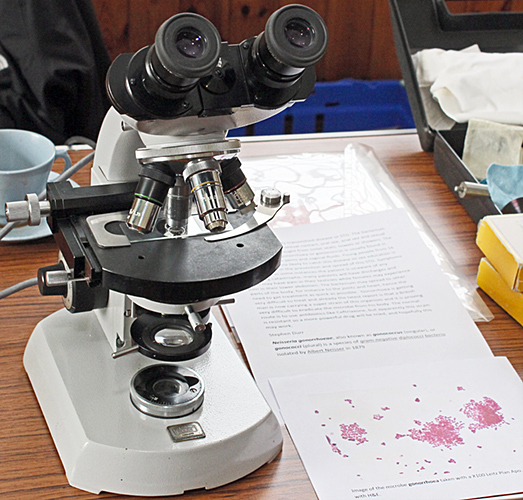 The exhibits gave rise to lots of discussions, but (as always happens when microscopists get together) many other subjects were raised. 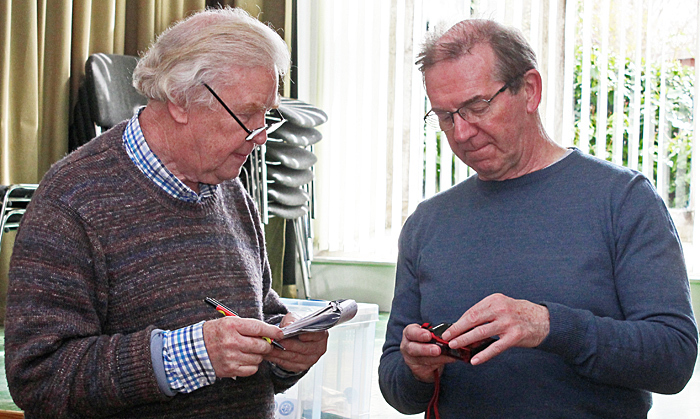 For example, local member Alan Casperd was looking for advice on the Olympus Tough TG-5 camera and Steve Durr was able to help, and wanted to know where to buy hippuric acid and hexadecane (for making slides for polarised light) and eBay was suggested. 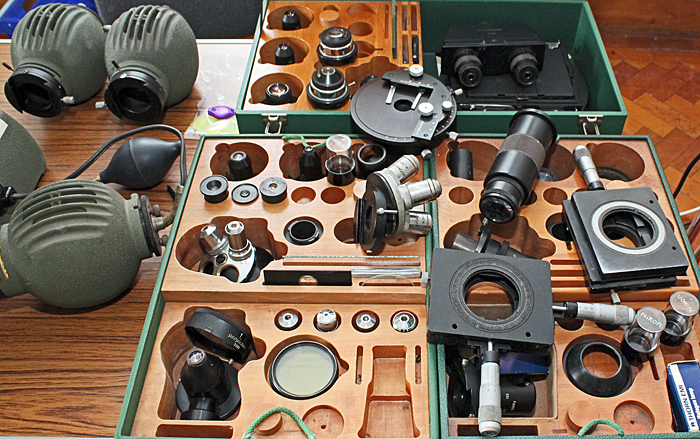 Recently-rejoined member Peter Wakeman was looking for advice on adding phase contrast to the Olympus BH-2 that he bought at the Reading Convention and Alan Wood was able to help. 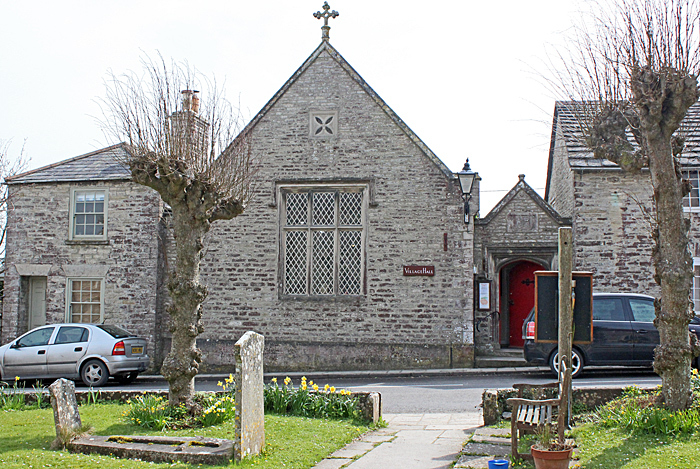 Our thanks to Brian Darnton and Derek Stevens for organising another enjoyable and successful meeting, and to Rosemary Stevens for keeping us supplied with coffee, tea and biscuits.